Part of having a strong work force in our industry is being away from the daily routine of busy columns, bouncy blow-drys and creative colours taking time with each other. In previous years we visited the cinema, took time to go for meals and had regular get togethers as a team and even took on The Great South Run last year. This year we decided to make the most of the lovely weather and do a completely different challenge, one you wouldn’t expect girls in this industry to take. The industry we work in is all about looking beautiful and glamourous and making others look and feel fabulous but for one day only we left the hair and make – up kits at home and took on The New Forest Waterpark. 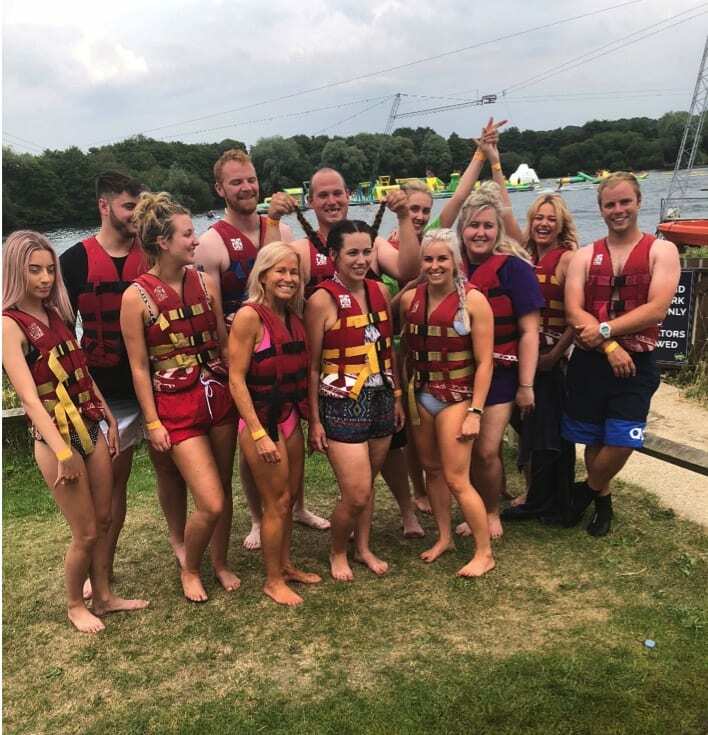 The waterpark is set on a huge lake with an inflatable obstacle course, it soon became clear there was no way we were going to finish the hours course without being drenched! When we arrived everyone was excited but also a little nervous about what was ahead, along we went to be safety briefed and get sized up ready for life jackets! We had a long, wobbly walk down the pontoon and off we went! The course itself was such fun, it had monkey bars, swings, slides and air bags. Everyone went off in little teams, helping each other onto the next obstacle desperately trying not to slip over and fall back into the water but no one escaped that easily! There was such laughter throughout the day and seeing the team continue to work so closely together outside of the workplace was a great feeling. After an hour of what felt like a full body work out we ended the day in the beautiful new forest, surrounded by donkeys’, ponies and even some cattle with a picnic. It was a day every body enjoyed and we still laugh about to this day, hopefully next years adventure will be just as much fun.